Cast Iron Skillet Cornbread - Mom. Wife. Busy Life. We are counting down the days until Thanksgiving and are preparing our meal plan for our guests this holiday season. My in-laws will be visiting this Thanksgiving and I want to make sure I serve delicious food for the entire family to enjoy during their stay. They will be here for a week and it’s up to me to have breakfast, lunch, and dinner plans each day since I know we will have some hungry guests! Some meals will be simple and others will take more time to prepare. This year, I’m making my mother in-laws special cornbread recipe as a side. My mother-in-law gave her cornbread recipe to me years ago and I wanted to make it for her when she visits so that she can relax while I do the cooking this year! Cornbread is the perfect addition to a Thanksgiving meal! 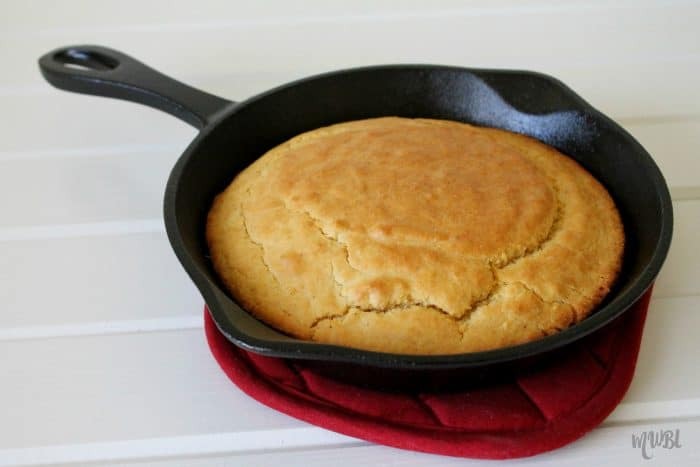 I seasoned my large cast iron skillet before making the cornbread by coating it with vegetable oil and putting it in the oven for about an hour at 350 degrees. Then, I took my cast iron skillet out of the oven and allowed to cool before making my cornbread. Get access to ALL recipes here! You can use a 10-12″ skillet for this recipe. 1. 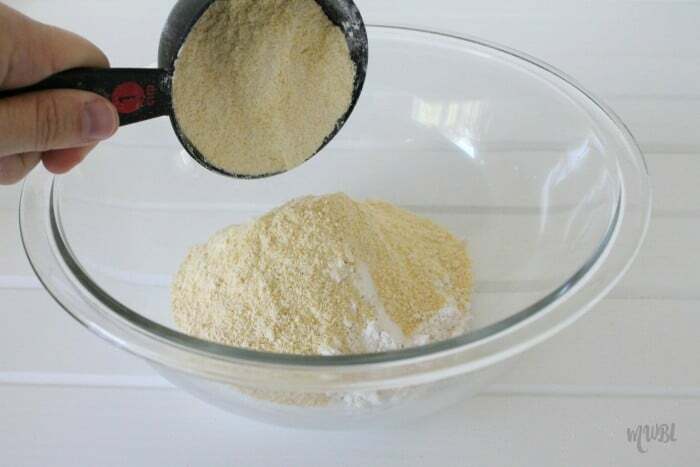 Pour one cup of flour and one cup of corn meal into a large mixing bowl. 2. 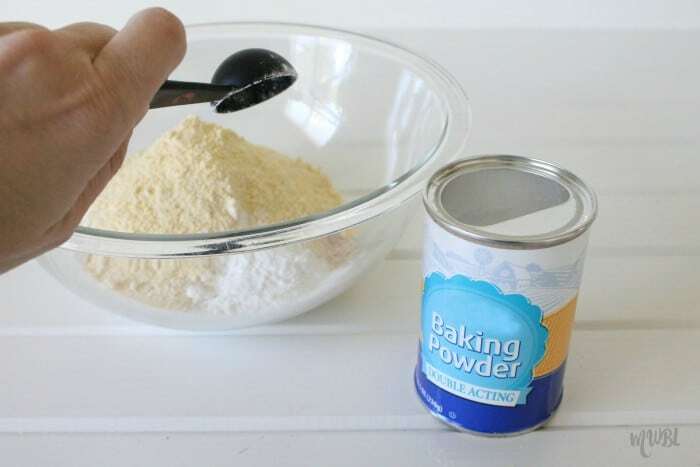 Add 1 tablespoon of baking powder. 3. 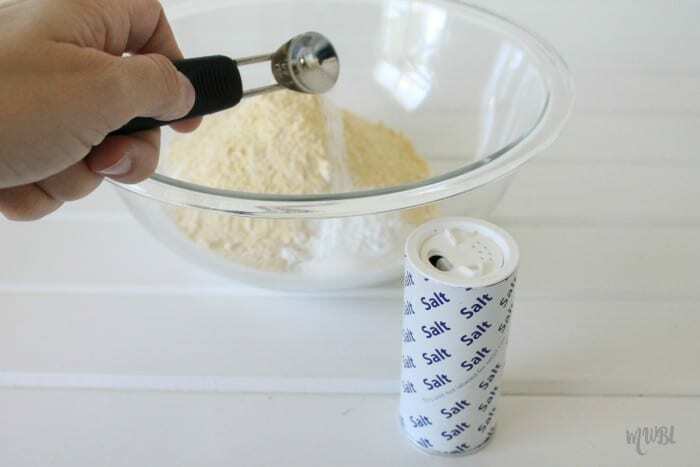 Add 1/2 teaspoon of salt. Set aside. 4. 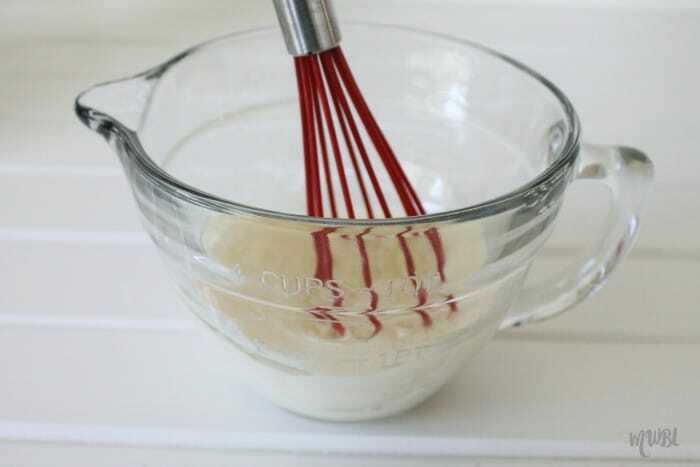 Using a medium sized mixing bowl, beat egg with a whisk. 5. 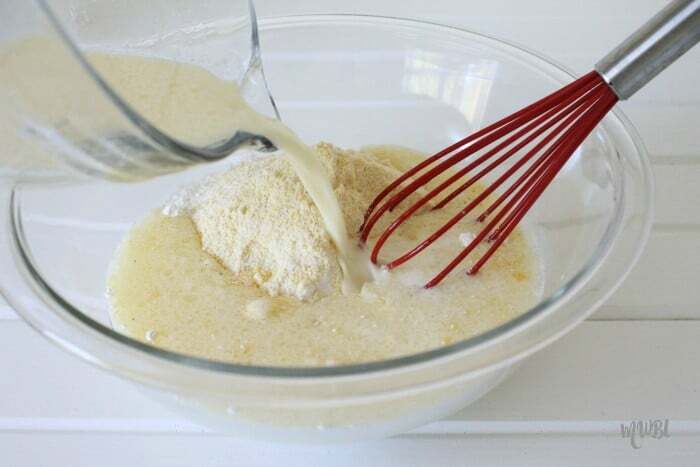 Pour one cup of milk and 1/3 cup sour cream into the egg mixture. 6. 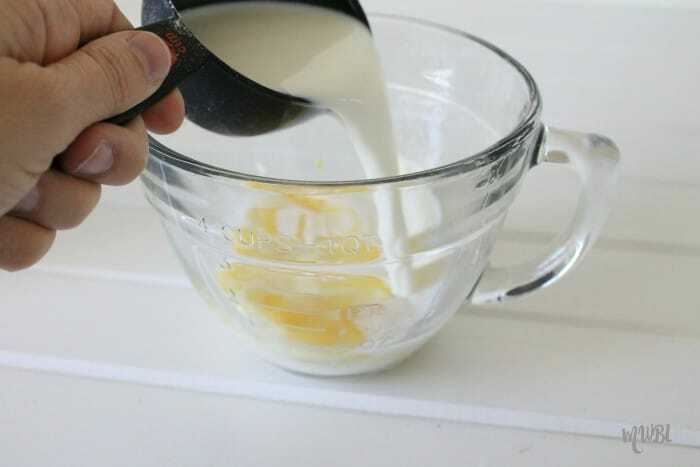 Add 5 tablespoons of vegetable oil to the egg and milk mixture. 7. 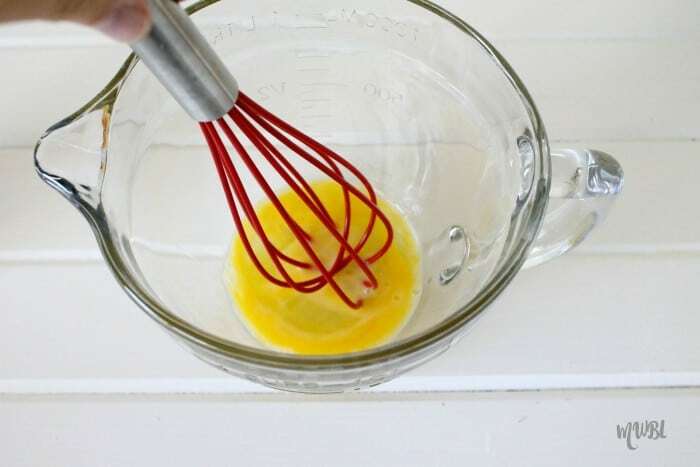 Whisk together the egg, milk, and vegetable oil mixture until well blended. 8. 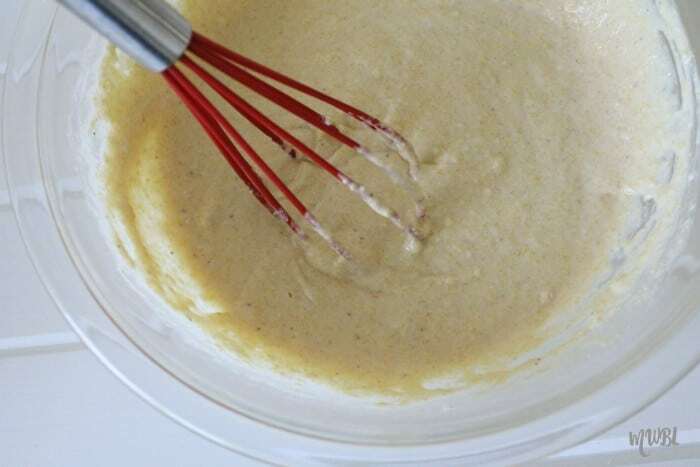 Pour liquid mixture into dry ingredients. 9. Stir well until blended. 10. 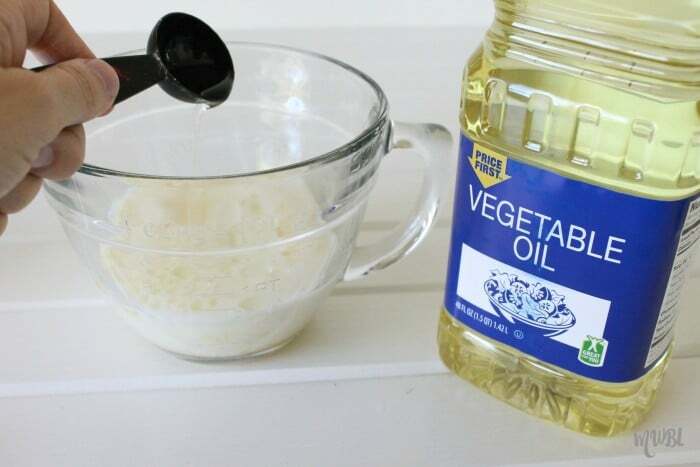 Pour mixture into cast iron skillet. 11. Bake in oven at 400 degrees for 20-25 minutes until cornbread is golden brown and an inserted toothpick comes out clean. I like to enjoy my hot cast iron skillet cornbread with butter and honey! This year, serve cornbread with your Thanksgiving meal. This cornbread also goes great with chili during cold winter days. You can serve cast iron skillet cornbread just about any time of year. 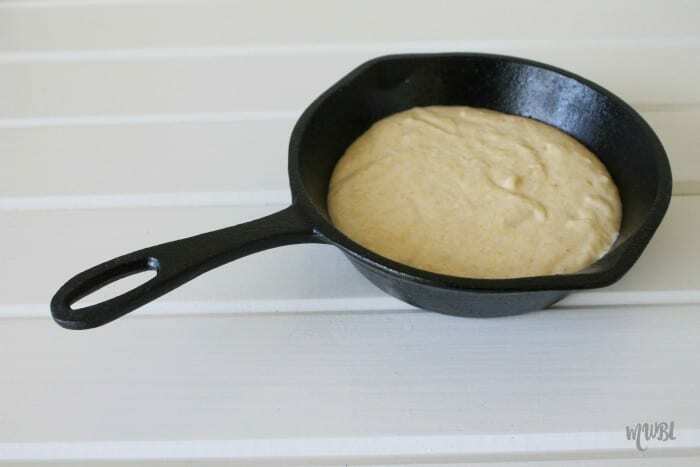 I have made my cornbread in a cast iron skillet for many years now. It’s even better if you pre-heat the skillet on the burner with about 4 tbsp of oil in it. Get it to frying temp. Add your batter to the hot skillet (you want it to sizzle when it hits the oil). Then pop into a hot oven. The bottom crust becomes very crispy, and very yummy! 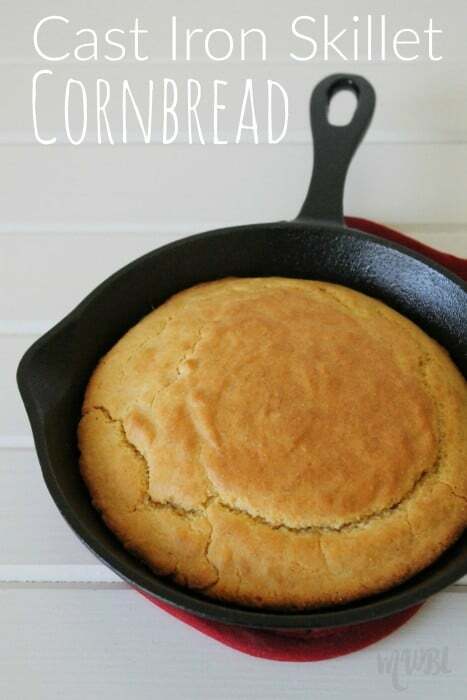 I’ve never thought of making cornbread in a cast iron skillet. Will have to give it a try. No estimate on cooking time? Depending on your oven (since temps vary), I usually check until the top is slightly golden brown. For my recipes, they take about 30-35 minutes. Hi, you don’t have a size listed for either a skillet or a pan?? You can use a 10-12″ skillet. 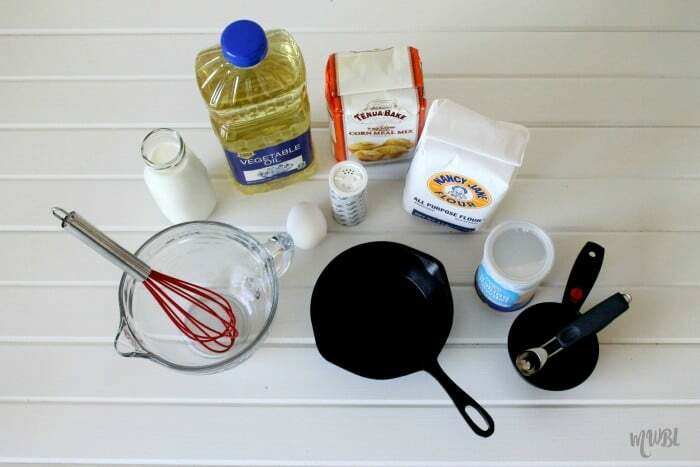 What size cast iron skillet is used? I use a medium/large size. I preheat oven and cast iron pan (2 T of oil in pan) to 425 degrees. Thickness is personal preference ~~ my family likes it thin (cover 1-2 “ of bottom) makes it crispy & yummy- also cooks quicker too. Make it thicker if you like! I’ve been making cornbread more decades than I’ll admit! I grew up eating your cast iron cornbread and have continued all my life (including last night!) If I may make a suggestion, add a can of creamed corn and cook foe almost an hour. The tenderness is to DIE for!!! Thanks for the tip! I should definitely try that!